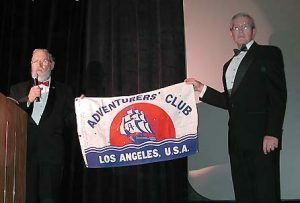 with an expedition Flag at Night Of High Adventure. Thus was the first Adventurers’ Club inaugurated and such are the personnel and spirit of all of the Adventurers’ Clubs. From this original Club have been founded The Adventurers’ Club, Chicago, in 1913; The Adventurers’ Club, Los Angeles, in 1921; The Adventurers’ Club, Copenhagen, in 1937; and The Adventurers’ Club, Honolulu, in 1955. The Club is affiliated with the Savage Club in London, the Travelers Clubs in Oslo and Istanbul, and the Adventurers’ Clubs in Pretoria and Singapore. The Club has always attracted the best and the brightest of the world‘s most adventurous spirits. A group of members of The Adventurers’ Club, then resident in Los Angeles, met informally many times in 1921. Under the leadership of Capt. Jack W. Roulac, they perfected plans for the organization of The Adventurers’ Club of Los Angeles. The Adventurers’ Club of Chicago forwarded copies of their Constitution and other papers, together with a flag, and on February 13, 1922, the Articles of Incorporations were filed with the Secretary of State for California. The Club has met every Thursday (holidays excepted) at locations ranging from The Wilton Studio, Chamber of Commerce Building (beginning March 8, 1922), to the present headquarters at 2433 North Broadway (beginning April 7, 1994). In 1939 a flag was designed by Ginger Lamb, wife of Dana Lamb, and issued to Dr. E.A. Peterson to be flown on Hummel Hummel in his cruise to the South Pacific, being returned several years later. The same flag then was carried by the Lambs in the jungles of Guatemala and Yucatan. This design was the official flag until 1953 when a new official flag designed by Edison Ostrom was adopted. Since then about 35 of these flags have been issued and returned to hang on our walls, inscribed by people met and strange names of far places. They have been carried to the rough country of Baja California, to the summit of Mount Ararat and the Matterhorn, in the Amazon jungles and over the Humac Mountains into Brazil from French Guiana, to Antarctica and the length of the Mackenzie River to the Artic, rivers of the Nile and Congo, river runs of the Grand Canyon of the Colorado and El Sumidero Canyon of Mexico, to the “Lost World in Venezuela,” the jungles of New Guinea, outback in Australia, on small craft to numerous islands of the Pacific, and many other places.